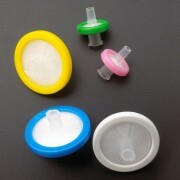 Syringe filters are single-use filter cartridges that are attached to the end of your syringe. Typically utilized to remove particles from your sample prior to high-performance liquid chromatography (HPLC). They can also be used for general purpose filtration and are very affordable, making them a great addition to any lab. Our experts at Pipette.com explore the importance and application of these tools below. There are a few particular laboratory procedures where using a syringe filter is very important to ensure accurate and reliable results. As mentioned above, syringe filters are most commonly used prior to HPLC analysis. This is due to the fact that particles can easily cause damage to an HPLC due to the high pressures and narrow bore that they contain. Using your syringe filter to remove these particles will ensure that this does not happen. Selecting to proper syringe filter for your application will ensure that you get the best out of your investment and increase the accuracy of your laboratory results. You should ask yourself questions such as: Does my filter need to be resistant to acids? What kind of samples am I going to be working with? Take a look at the following guidelines to help you in your selection process. When working with aqueous samples, choosing a syringe with a hydrophilic membrane is ideal – Nylon, PES, GHP or PVDF membranes work best. Keep in mind that polymeric membranes have different chemical compatibilities, so choosing a syringe filter that is in-line with the chemicals that your research is utilizing is essential. 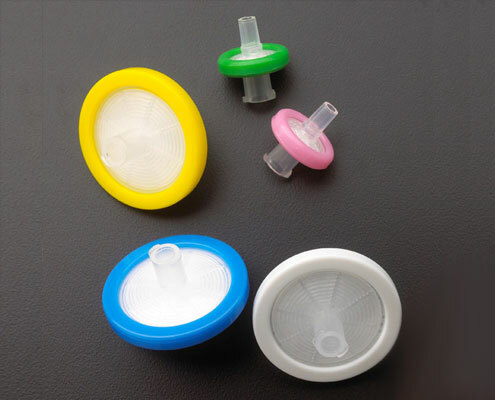 In general, one syringe filter type will not be compatible with all kinds of applications due to differences in chemical compatibility and hydrophobicity/hydrophilicity, although some products may offer universal applications. Although filters are designed to increase the accuracy of your experimental results by removing contaminants and unwanted particles, using the wrong filter can actually do the opposite, which is why it’s so important to choose the right filter for your application. Using the wrong filter can cause extractables to elute into your samples from the filter. Due to the fact that hydrophobic membranes, such as PTFE membranes, repel water and do not react with aggressive organic solvents, they are great choices for working with gases and organic solvents. If you’re looking for quality laboratory syringe filters, our selection at Pipette.com is sure to have something suitable for your needs. The brands that we offer are quality products that we have handpicked to become a part of our inventory due to their effectiveness and reliability. For a complete look at all of our products as well as regular promotions and deals, take a look at our webpage here. 3 Microcentrifuges Your Lab Should Know About Electronic Pipettes – Are they Right for your Lab?